L3 Narda-MITEQ announced today the release of a newly extended frequency designed series of cost-effective small size phase-locked oscillator series 2LPL. The 2LPL series comes in 51x51x15 mm has an operating temperature from -40°C to +80°C and weigh less than 100 grams. 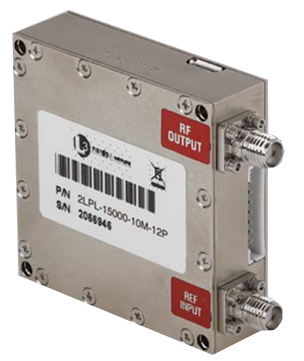 The 2LPL operates at a single frequency from 0.010 to 15 GHz in bands and 19 GHz in extended bands with the option of doubling frequency by using an external multiplier. It is the ideal small in size yet high performance when it comes to Low Phase Noise and spurious. The 2LPL has a built-in reference cleanup as a standard feature. The 2LPL operate from either external reference or internal TCXO with stability as low as 500 PPB. Flexible internal DC regulators allow operating DC from +6.5 VDC to +28 VDC. The construction of the device promotes excellent RF and reliability performance and meets MIL-STD-202 requirements for shock, vibration, humidity and altitude. L3 Narda-MITEQ combines more than 60 years of innovation and expertise in microwave and RF technology. The company designs and manufactures both standard and custom products, with stock delivery offered for an extensive selection of catalogue components. L3 Narda-MITEQ provides a broad range of passive and active components, subsystems, pin diode control products, IMAs, SATCOM solutions and spaceborne components, as well as RF safety monitoring equipment. Its products and services support Aerospace / MIL, research, communications, scientific and medical end markets. To learn more about L3 Narda-MITEQ, please visit the company’s website at www.nardamiteq.com.